The Archangel Raphael is esteemed as the guardian angel of the human race. He especially protects the young and innocent, and he guards pilgrims and travellers from harm. 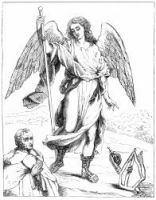 It was the Archangel Raphael who warned Adam of the danger of sin and declared to him its dread consequences. 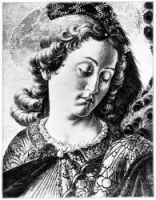 Representations of the Archangel Raphael are far less numerous than are those of Michael and Gabriel. They are always pleasing, and present him as a benign, sympathetic, and companionable friend to those whom he serves. His symbol is habitually a pilgrim's staff; as a guardian he wears a sword, and has a small casket or vase, containing the "fishy charm" against evil spirits. 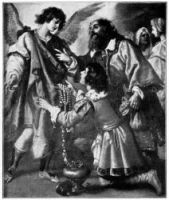 He wears a pilgrim's dress, has sandals on his feet, and a pilgrim bottle or wallet hangs from his belt. His flowing hair is bound by a diadem, and his beautiful face expresses the benevolence of this character and mission. 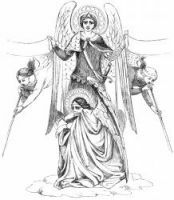 On this page you'll find drawings of Archangel Raphael taken from my collection of antique Bibles and story books. You're welcomed to use these pictures of Archangel Raphael in your artistic creations. 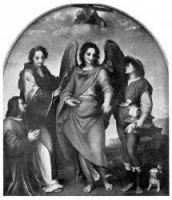 Click on the Archangel Raphael illustrations below to see more details about saving a free Archangel Raphael image or about purchasing the images of Archangel Raphael at a higher resolution.